Preparing for the holidays can be stressful, especially with the mad rush for holiday sales, heavy traffic on the road, and perpetually long lines in department stores. Instead of enjoying the festivities, you end up feeling tired and anxious that you can't wait for the holiday season to be over and done with. But there's no need to further complicate things, especially when you can look forward to a well-deserved relaxation. Here are some ways you can de-stress so you can greet the new year feeling fresh and recharged. 1. Have an energizing foot spa. Your feet take quite a beating from going to malls and gatherings with family and friends. Give them their much-needed TLC by treating yourself to a foot spa after all the walking you've done. 2. Drink a calming and uplifting cup of tea. Going through Christmas traffic can get pretty stressful, and so is joining the big mall crowd during your last-minute shopping. Treat yourself to a warm cup of ginger or green tea to soothe your senses. 3. Get a revitalizing facial. Don't face the new year looking all frazzled and worn out. A full facial treatment to remove impurities and stress lines can do the trick for you. Take a breather and come out ready to face everything 2018 will bring. 4. Detox your hair for a deep cleanse. The holiday season means going from one party to another, which exposes you in the open streets when commuting. That said, being exposed to pollution can be very unforgiving to your hair. 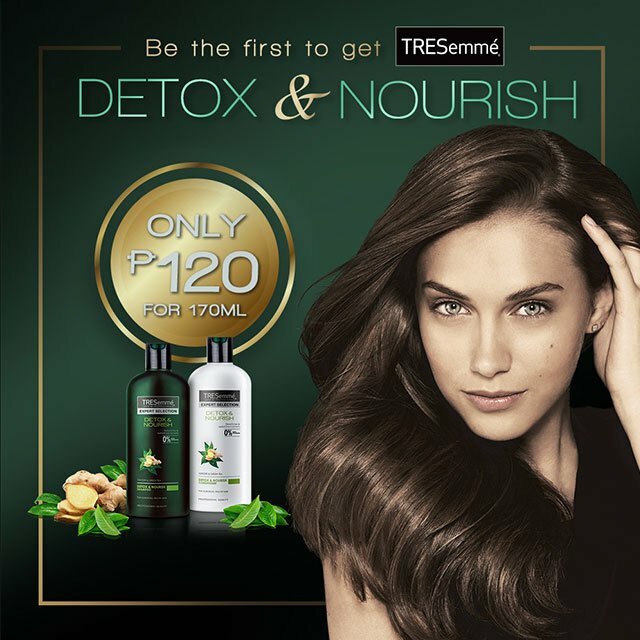 Use TRESemmé Detox & Nourish when you wash your hair in order to replenish all the nutrients it has lost. Thanks to its green tea and ginger ingredients, you can look forward to the new year with great-looking hair. You don't even need to go to the salon to get this treatment—you can do it right at home. That's the kind of relaxation and convenience you deserve. The new TRESemmé Detox & Nourish line is available at all leading supermarkets, personal care stores, drugstores, department stores, and e-comm sites. Grab yours now!